I'm so ecstatic to announce that Lindsay Cummings is coming out with yet another fantastic and exciting read! 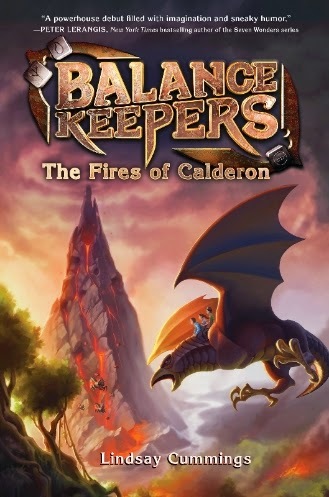 The Fires of Calderon by Lindsay Cummings will be available in bookstores on September 23, 2014. The author of The Murder Complex comes back and surprises us with a YA fantasy novel. I'm so getting a shelf ready just for this series. After following a mysterious map into the woods and then under the woods, eleven-year-old Albert Flynn learns he's a Balance Keeper- someone with special magical skills for fixing problems in three underground Realms at the Core of the earth. His new job is important; if the realms fall out of balance, the world above could be in great danger. Albert and his Balance Keeper teammates Birder and Leroy arrive in the Core not a moment too soon. There's an Imbalance in the Calderon Realm and it's threatening to bury Albert's hometown of New York City in a mountain of ash. With the situation in Calderon growing worse every day, can Albert, Leroy, and Birdie restore balance before New York is destroyed forever? Will Albert master his Tile before it's too late? Lindsay Cummings is quickly climbing the stairs of fame. No.. correction. She's taking the elevator there. Her book, The Murder Complex, is now a well-known dystopian that I'm sure all YA readers will love. That's coming from me, a person who's already read it (and loved it). Check the review here! The plot was riveting and the characters were swoon worthy! I just hope (I wish, I beg) that I can make it to the bookstore on the way home from school to pick up this book. I recall seeing Lindsay Cummings at the CBC BookRave signing, and she kind of signed my book. SO that was a fabulous fangirl moment for me. To support Lindsay, go out now and buy her new book before they're all gone from the shelves. They're going to go quick! I read The Murder Complex, and I loved it. There is not doubt in my mind that I'll enjoy this book just the same, or even better! What are you waiting for? Are you really gonna miss out on all the action and adventure with Albert? Oh I am SO excited to get my hands on this book! I actually featured it as my WoW pick a few weeks back :D I haven't read anything by that author yet, but this one sounds like the perfect place to start! I hope we can both get our hands on this one soon!! She also wrote The Murder Complex, which has been the topic of YA books this month! I can't wait to read this one!